UnderMind has served the Vicious Circle for a great many years, serving under all of its various leaders. 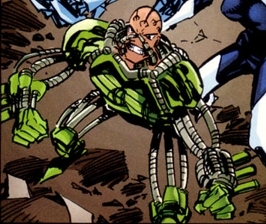 He was one of the dozens of villains that Horde sent to kill Dragon, only for them to be shrunk down in size by a Martian weapon. UnderMind spent a couple of years in this state before getting restored to normal. He took part in the raid upon Hillman Hospital where the Vicious Circle stole a unit of Dragon’s blood so that they could create the ill-fated Dragon Army.